Prevention Link’s Spring Mega School will be held at Fern Resort in Orillia! 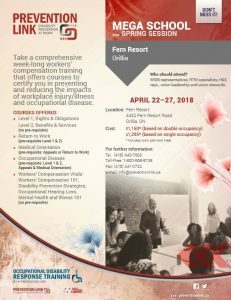 Take a comprehensive week-long workers’ compensation training that offers courses to certify you in preventing and reducing the impacts of workplace injury/illness and occupational disease or injury in your workplace. Time: Registration runs from 3-5 p.m. on Sunday, April 22. Classes start at 7 p.m. on Sunday evening and end Friday at noon. Download the registration form for our Spring School.